Let me state that through the Star Wars Saga, and in books continued, most of us have started to grasp the true nature of Boba Fett, his mannerisms, characteristics, and procedures that he has always desplayed to date. 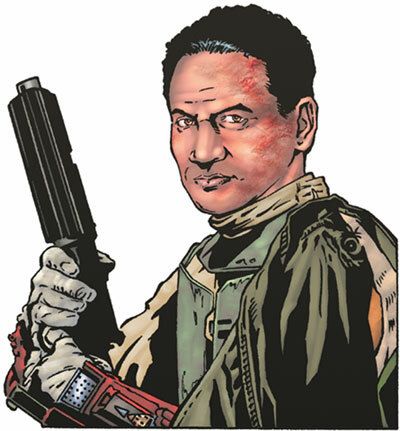 I have noticed a post, a picture, of Boba Fett without his mask. May I state that his classification, rank in the bounty hunter trade, and the way in which he presents himself for his work completely contradicts this picture. I could care less if he was making terms with Lord Vader himself, but in noooo way would he ever take of his helmet showing what he looked like underneath his T-shaped visor. The fact that no one has truly seen his face since his father had died in the Clone Wars is a part of the fear factor that the galaxy has come to visualize in the Star Wars universe. The helmet is as much a part of him as the rest of his armor. Never would he remove it in full view of the public for Fett is far from ignorant. A newb with great grammer and the ability to think, something quite rare. Dengar did see Fett without his helmet, but that is pretty much it. Its not perposterous, its just how it goes. Carrying Boba Fett out of the Sarlacc's acid stomach and healing him back to life WITHOUT taking his helmet off, is whats perposterous. Thats just stupid. Fett didnt even take it off, it was Dengar and Manaroo. And Neelah also saw his face. Boba Fett, in return for taking him out of the Sarlacc pit, offered him a partnership, that or death. Dengar was in as much fear knowing that he seen Boba without his helmet on, mulling constantly on the consequences of reviving him, and to Boba Fett was only seen in this condition due to the fact of being unconscious and with no other choice. This was one occassion where Fett was seen without the helmet. It also never mentions specifically if Manaroo saw his face or not, she was just aware of the situation. Neelah also had the same thoughts as Dengar. T-Shaped is a great addition to this community. I hate that Fett has ever been unmasked, especially in those prequels. Never should've been done. Complete sin. Well, the picture in question is from one of the Star Wars Infinities series. So, it's not really continuity. It's the one where Boba ends up frozen in carbonite and as Lando's work desk. So, I agree, he would never take his mask off and have his feet propped up on the table when someone walked in the door. Especially, if that someone could end up on the receiving end of his blaster. As for Dengar seeing his face. That was out of neccessity. Also, Fett would have had chemcal burns at the time, from being in the Sarlaac's stomach. Having to bandage his face, when not in his armor, in Twin Engines of Destruction would attest to that, I think. So I don't think it really would've mattered if Dengar saw his face, since it was scarred at the time. Mabye after a few bacta treatments, then yeah, but as I recall, that didn't happen later in the book. This is the major problem for me. I don't care if Dengar has seen him unmasked or things like that which are a matter of life or death. If he has a head, he has a face. That's life. However, what I do have a problem with is the whatever manner in which Jango Fett was unmasked whenever, like yeah, I want some fresh air type of crap. He was unmasked a lot. Jango Fett turned Boba Fett's cold hard helmet from a cryptic face of destruction to the equivilent of a BIKE HELMET. Jango puts it on for SAFETY. He is a DWEEB. Fett was cold, hard, calculating. Why would he let people see his face? It makes him LESS scary and makes him an EASIER MARK. Fett probably goes unmasked and unarmored to places when he has to, to blend in. If everyone knew his face, wouldn't it be a little like being a celebirty and not even being able to go grocery shipping? Whatever, I hate the removing of the helmet. Jango and Boba are two different people. Jango went unhelmeted a lot, Boba didn't. I don't like the picture in Insider. I doubt he cares about his looks so much that he grooms his face hair into a nice, neat little pattern, beard-goatee-whatever. The pictures of his unmasked face in the SW Tales comics are much better. Though that Titanium Diecast figure's face is horrid. The Titanium Diecast figure made him looke liike he would say "I'm Fett, Boba Fett, and I want it shaken, not stirred." Were you talking about this pic, that was in the Insider? I was confused about that, too. I figured Fett's Sarlaac's scars would've been a lot worse than that. When you visited the artists' website, though, the title of the picture was called "Spar." I think he actually intended the picture to be the ARC Trooper Alpha-02, the one who called himself Spar. He was also known in the Insider article as Mandalore the Resurrector, because he's supposed to be the one who had the latent memories of Jango Fett, and so decides to reform the Mandalorian Protectors. Here's the Wookieepedia article for anyone who's interested, but I think the Spar thing makes more sense. I mean, he was the one who was mistaken for Boba Fett by Ailyn Vel, as well. Which was bad news for him, apparently. It's a neat article, though. Enjoy. The very lst image is what we were talking about. Very tacky of whomever at Wikipedia to hack off the watermark at the bottom, but keep everything else. That picture of Boba when he's sitting down on that chair with his helmet off, doesn't make him look how he's supposed to look, I mean come on! The guy has been through hell and back and he looks like he's been rubbing anti-aging cream on his face or "Scars-no-more", I'd draw Boba with a more mature rugged look! The pic Aaron has shown is not working here, but I think I know what pic it is. I think that thats how he looks, except your right, he could use a little scars here and there. Other than that, he looks perfect to me. The angle of his head, the glair in his eyes, his hair, all look perfect to me. I mean if you put the helmet on his face in the oicture, the angle of his head would turn out to be the Fett gaize! Anyone know what Im talkin about? The picture works fine if you click the link; you can't just copy the URL, as it's truncated with "..."
Sorry, its still not working. Yeah, I have seen that pic too--I also thought it odd that he would remove his helmet. The helmet is just a part of him. I just finished reading Mandalorian Armor and Slave Ship, so thankfully, I know what you guys are talking about with Dengar...lol. I liked his and Neelah's reactions to Boba's image when they rescued him. He might have some scars from before he was a bounty hunter, and wearing the helmet. You can't scratch that out as a possibility to them. But he wore his helmet pretty much all the time after AOTC, and he didn't have any scars in AOTC. Though I suppose it is possible he got a scar or two inbetween wearing the helmet. Or when he went in disguise. I remember once in the Han Solo trilogy that he was bording a passanger liner or something and he was disguised as an alien. So if he did do that, he might get a cut or two from being in disguise, which would be minus helmet. Disguises---true, true. In Slave Ship, Fett dresses as one of those miner people when he was working "with" Bossk. Yes, in his trade--scars could come from anywhere.